Just like to start out with a special little something for all the 50mm’s out there. The 50mm was the “normal” lens back in the film days, and are still regarded as one of the best values today, no matter which camp you’re in (Canon, Nikon, Pentax, etc.) I’ve seen Canon’s 50mm f1.8 Mk II go for $70 on amazon.com pretty often. With L glass going into 4 digit pricing easily, you can’t beat that price anywhere… Well, except when it comes manual focus lenses. As I began my journey into DSLRs and photography, I never expected to get into “old” technology. Here I am with the latest and greatest camera, fully equipped with a very decent kit lens and a even better telephoto. VR, ED, IF, AF-S and all that jazz. What more could one possibly want? But after a few uses, it became apparent there were indeed limitations in the kit lens, especially in low light. Like many before me, I ventured into the never ending pursuit of faster glass. What better value can anyone ask for than a 50mm f1.8 lens for under $100? 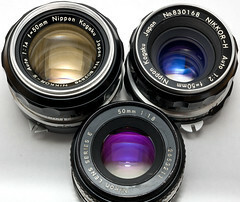 Being a cheapskate at heart, I asked that question and discovered the answer: manual lenses. With autofocus everywhere in the market, one wouldn’t even know that manual lenses ever existed. But the decades of technology doesn’t just disappear into thin air–they end up on ebay. The manual version of the 50mm f1.8 can now be had for a fraction of the price of that already great value autofocus counterpart. This makes the manual 50mm an exceptional value. Check out the prices I paid for these 50’s. Autofocus technology does have its advantages, but the optical formula has not changed all that much for the 50mm primes over the years. Image quality is just as good as any autofocus today. In addition, manuals have the benefit of a better dampened focus ring, superior all-metal build quality, and above all… they are dirt cheap. Long live the old 50’s.